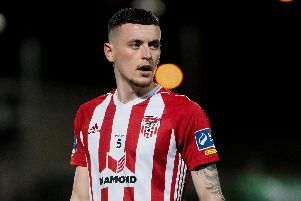 Derry City’s Conor McDermott says he’s adopting a more positive outlook to help put last season’s injury nightmare behind him. The right-back has been dogged by various injuries over recent years but said he has been injury free since last year’s hip operation and feels his change of mindset has played a part. McDermott also stressed it was the support of his family and girlfriend, along with boss Declan Devine, which played a pivotal role in getting him back out on the pitch. “Over the last couple of years injuries haven’t been my friend. Even when I was growing up, I always seemed to get the wrong end of the stick or never had that bit of luck,” he confessed. “When things were going really well, it always seemed that things went against me but I’m not going to let that happen this year,” he stated. “I’m going to have a positive attitude towards everything now and hopefully I can get a bit of luck in it. I’ve had a lot of support from my family and girlfriend. They got me through the tough times and it’s great to be back training and playing without having any pain. “Every time I spoke to Decky, he has been brilliant with me. He’s always giving me advice on how to deal with things like set-backs and disappointments. I didn’t have that before. “Just to have that positive out-look on everything, even if you do get an injury, you have to think that it’s going to make you stronger as a player and as a person. “I’ve had a lot of support from my family and girlfriend. They got me through the tough times and it’s great to be back training and playing without having any pain. The 21-year-old made his long awaited return to the first team this season at Bohemians a few weeks ago and is glad to be back in the squad. However, he knows he can’t let his standards drop given the increased competition for places. “I’m buzzing to get back after the last year or so. It has been quite hard to get through but I feel really good now and I’m getting back to myself the last couple of weeks,” he added. “I was going into games short of fitness and then, coming back, I wasn’t training. Looking back now it wasn’t the right thing to do but at the time I thought it was. “I know I probably should have got the surgery earlier but it worked out well in terms of getting back for the start of this season and I’m just glad to be back playing. McDermott admits that the feel good factor is back around the club and despite defeat in their last outing against champions, Dundalk, the N Ireland U21 international felt the home side played well. “It was a tough game but I thought we played really well. The goals came at a bad time, just before and after half-time, and that killed us a bit,” he said. “To be fair, we never gave up and that’s the attitude of the team this year. To give everything until that final whistle is blown. “Even coming into training the buzz is back. Coming in every morning the boys are all enjoying a laugh. “When we go out to train, we all know it’s work time and everyone puts in a shift but after training all the boys are together.